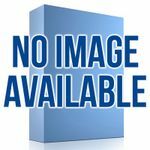 This is a list of games using the Decktet, ordered by rating. Simple as that. 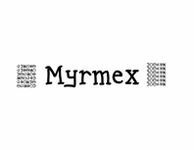 Myrmex is an olde style solitaire game for the Decktet. 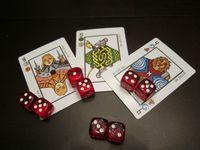 Two Decktets are required to play. 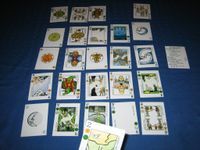 The object of the game is to organize all of the cards into 6 piles that share a single suit and are in descending rank order from Crown to Ace. Myrmex is an engaging and utterly addictive Spider solitaire experience. Don’t play this game if you have something important to do today. 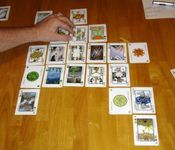 Dectana is a sibling of the Icehouse games Zarcana and Gnostica, but uses two Decktets instead of a Tarot deck. With six suits instead of four, with each suit having two abilities, the player options have never been as flexible. 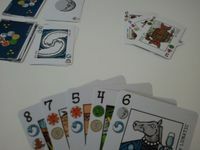 Hoard three Aces to end the game, then the player with the highest score wins. 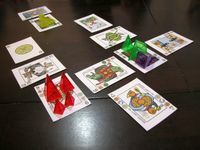 This is the first game that uses both the Decktet and Icehouse pyramids. EDIT: If you want to play a CCG with the Decktet, this is it. 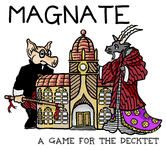 This was the first Decktet game to get enough ratings to have a rank in the database. A trick taking game in which the top suit of a card is what matters for following suit and the other suit determines which top suits count as trump. A trick-manipulating game for 3 players with hidden goals and a deduction aspect. A climbing game for 3-4 players. 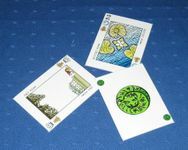 A trick-taking game in which players have to follow type rather than following suit. Uses suit chips for scoring. My review: Shed like a house, or shed like a dog? A market manipulation game that uses suit chips to represent shares in the different suits. Can be played with 2 or 3 players, but is best with 3. 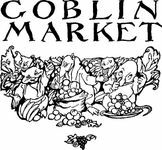 An auction game inspired by a 19th-century fantasy poem. Because the world needs more games about dueling wizards. 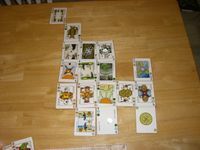 This game uses both a Decktet and Looney Pyramids. Theme: You are a hermit. You go out during the day but don't want to have people follow you home. 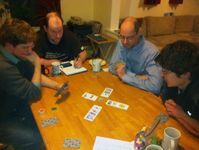 Mechanics: It's a simultaneous trick taking game, meaning that there are typically several tricks in progress at a time. 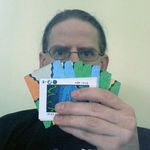 The goal is to avoid taking personality cards. 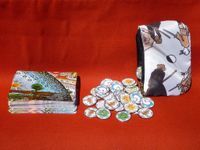 A tug of war game for 2 players, created for the August 2008 Game Design Showdown at the Board Game Designers Forum. 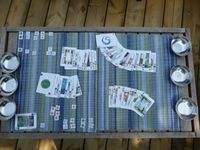 A 2 player game about sorting cargo. It doesn't require table space, so you can play it while standing in line. Each player tries to become the Lord High Chancellor or, failing that, avoid getting sacked. A game of growing the tree of life - until it gets too big, and then you get stuck with the branches.